Plastic cookie cutters measure approx. 3" x 2.5"
Take notice the characters featured in the cookie cutter 2-pack are nothing like cookies. They certainly aren't sweet, we would never get excited to come home to them and they're definitely not cookie-cutter, do-gooder types. These are also all the reasons why we love this horror-themed kitchen utensil. 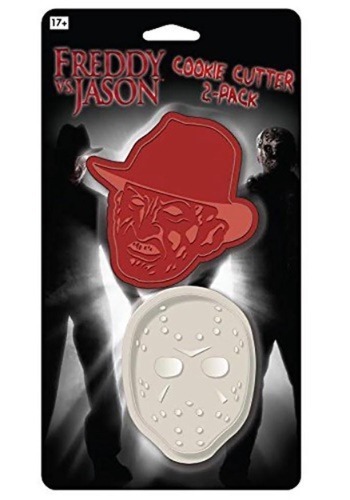 The Freddy vs. Jason cookie cutter 2-pack creates ironically creepy cookies in the shape of two of the most famous serial killers. When Freddy and Jason are in the form of oatmeal raisin, chocolate chip, or peanut butter cookies they don't seem as threatening. No matter what type you decide to make, they'll be scary-good. The officially licensed Freddy vs Jason cookie cutter 2-pack comes with two plastic cookie cutters in the form of Freddy Krueger and Jason from the Halloween movie classic, Friday the 13. Each measure approximately 3-inches by 2.5-inches, creating the perfectly-sized cookie. Please note, there are also cookie and frosting recipes included on the back of the package. Time to start planning the spooky soiree. Throw a Halloween party and bake some desserts using the Freddy/Jason cookie cutter 2-pack as a fun surprise for all your guests.